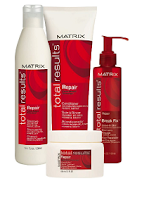 Enter to Win 1 of 5000 Matrix Total Results Break Fix Elixirs! Head over to Matrix's Facebook page and enter to win 1 of 5,000 Total Results Break Fix Elixirs! When you enter, you'll also be entered to win the Grand Prize - (1) MATRIX® TOTAL RESULTS™ BREAK (up) FIX KIT including (1) $500 AMEX® Gift Card and (1) full TOTAL RESULTS™ REPAIR line!